James Mallie (J.M.) Green, 97, went home to be with the Lord Wednesday at his home. 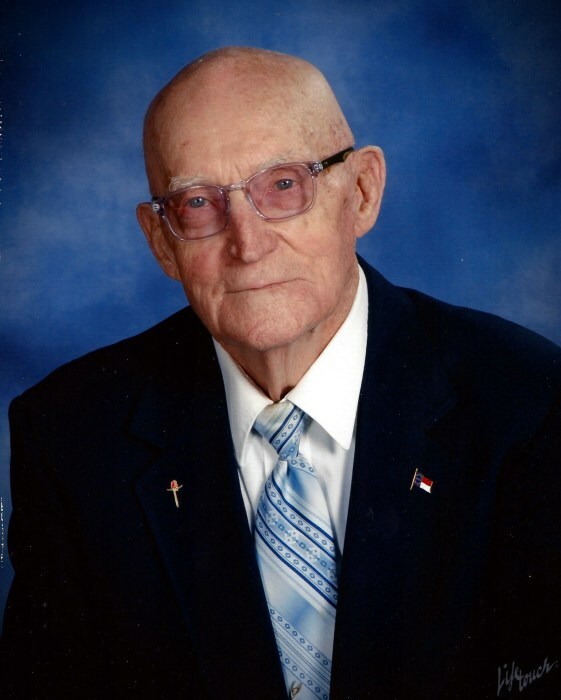 He was born in Johnston County a son of the late James Mallie and Lura Parham Green. Preceded in death by his wife, Doris M. Green, sisters, Christine Wall, Winnie Carroll, Johnnie Johnson, Lucille Turnham, Lessie Mae Johnson, brother, Labon Green and a grandson, Scott Earp. Mr. Green was a retired farmer and worked 31 years at Westinghouse in Raleigh. He was a highly decorated WWII veteran of the US Army, who served in the 362nd Infantry of the 91st division in Italy. He was a radio messenger and his medals included the Silver Star, Bronze Star, WWII U.S. of America medal, the American Campaign medal, and the European-African-Middle Eastern Campaign medal. His Silver Medal was given to him for shutting down a German Machine-gun crew and capturing 16 prisoners. A funeral service will be held 2 pm Saturday at White Oak Baptist Church with burial to follow at Clydes Chapel Baptist Church Cemetery. Visitation Saturday 12:15 – 1:45 pm prior to the service. He is survived by his very best friend Baby (Jack Russell); daughters, Saundra Freeman (Ray) of Archer Lodge, Jeannine Earp of Archer Lodge, Edie Nowell of Wendell; son, Eddy H. Green, (Val) of Archer Lodge; sisters, Dorothy Perry of Wendell and Joyce Harris (Talmadge) of Salisbury; grandchildren, Jeanne Tomlinson, Laura. Shidal (Travis), Denise Driver (Greg), Shannon Green, Jason Green (Jenny), Sandy Morgan (Jon), Paul Nowell, Emma and Gabrielle Grant; 11 great-grandchildren. In lieu of flowers memorials may be made to Care Givers of White Oak Baptist Church or Archer Lodge Veterans Memorial.